Ankers Away a 48 Kadey Krogen Classic is a very well maintained and updated example of a quality bluewater trawler with live aboard comfort. She offers all the luxury options including stabilizers, hydraulic bow thrusters. 12 kw generator, 3 zone reverse cycle AC, watermaker, and ultra leather upholstery. Naval architect James Krogen once said "To produce a successful design, you must take an honest determination of how the vessel will 'really' be used and then prioritize every design decision to favor that outcome. 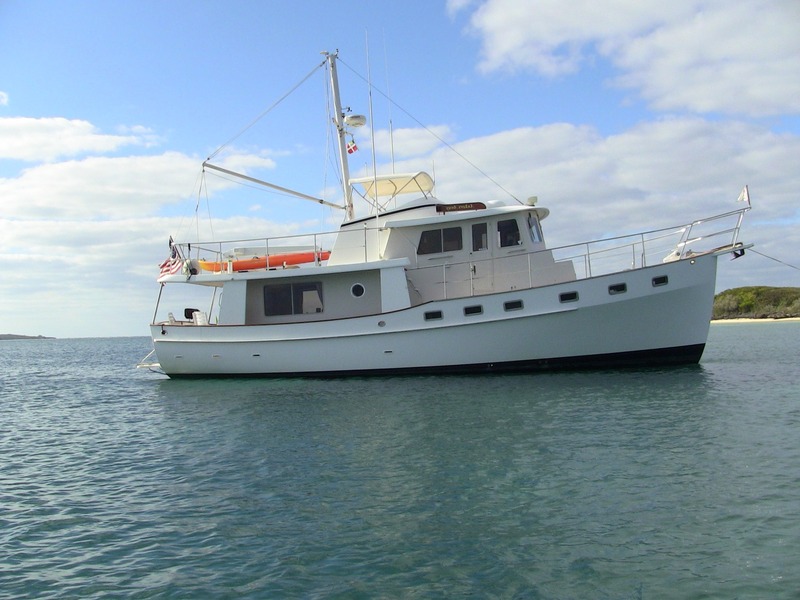 "In the case of a Kadey Krogen full displacement trawler that "outcome" is a seakindly, live aboard ocean cruising yacht with optimal efficiency and stability. Ankers Away offers attractive classic Kadey-Krogen design with full walk-around decks and the most popular 2 stateroom, 2 head interior arrangement. The beautiful teak interior and quality of workmanship is something you would expect from one of the worlds most experienced builders. Ankers Away has benefited from a meticulous maintenance routine and ongoing upgrades and service to systems and machinery.True to their original form, Kadey-Krogen utilize a "Pure Full Displacement" hull with short radius bilges for superior efficiency and gentler motion at sea. Their V-sections aft yield enhanced end-to-end symmetry, which adds to their efficiency and sea-kindly motion while minimizing the risk of broaching in severe conditions. A fine, clean entrance forward results in a soft, dry ride.The low horsepower required to run these efficient hulls at their cruising speeds translates into impressively low fuel consumption.